This week, we’ll be joining health experts, policy makers and business leaders at The Partnership for a Healthier America (PHA)’s annual Building a Healthier Future Summit. We’re looking forward to inspiring discussions about the path forward to ending childhood obesity. This year’s PHA gathering provides a timely platform to catalyze conversation and collaborative action to ensure healthier lifestyles for all Americans. As you know, this year’s updating of the Dietary Guidelines for Americans brings a renewed focus to the intersection of food and public health. Yet there seems to be an ever-widening gap between recommendations and actual consumer behavior. This is another reason why PHA’s ability to attract leaders from industry, government, organizations and our frontline health care providers to catalyze conversation and collaborative action is so important. Last year, PHA and The Dannon Company announced a three-year commitment to improve the nutrient profile of its yogurt products, and an investment of $3 million in nutrition research and education. This commitment exemplified three key areas of focus in creating healthier Americans: education, research and product improvement. For more information on the progress of this commitment, see our infographic. Continuing to build upon these types of partnerships, and create more in the future, will bring us all together on this road to a healthier future for all Americans. As the Summit unfolds, One Yogurt Every Day will be present through The Dannon Company’s Yogurt Power Lunch on Thursday, February 26, from 12:30-2:30pm and at The Dannon Company’s booth, #14 in the Expo Hall on Thursday and Friday. 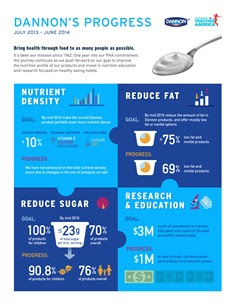 If you’re not attending the Summit, follow along with the hashtag #PHASummit, and learn more about the role of yogurt in a healthy diet by checking out our infographic and PHA recipes. Also, be sure to mark your calendars for the Ohio State University Food Innovation Center’s second Dietary Guidelines Summit that will be held at National Geographic in Washington, D.C. on May 21, 2015. We will be sending more information on the event agenda and a link to register in future newsletters. One Yogurt Every Day (OYED) Nutrition Advisor Constance Brown-Riggs, MSEd, RD, CDE, CDN, will discuss lactose intolerance and minority health during an upcoming webinar with the National Organization of Blacks in Dietetics and Nutrition (NOBIDAN), a Member Interest Group of the Academy of Nutrition and Dietetics (AND). Tune into the webinar on Thursday, February 26, 2015 at 2pm by visiting the website. This discussion will help define lactose intolerance versus lactose maldigestion and cover the unintended consequences of avoiding dairy products. African and Latino Americans most often do not receive the necessary amounts of key nutrients that are essential to a healthy diet, and this is often due to a misunderstanding of how to consume dairy products. Both groups suffer from higher rates of obesity, diabetes and heart disease than non-minority groups. A healthy future awaits as this webinar helps to dispel common myths and help clarify the best ways to incorporate dairy products, especially lower lactose options, such as live and active culture containing yogurt options. If you are unable to tune in to the live webinar, check back on the NOBIDAN website for a recording after the event is over. Yogurt takes the spotlight in the most recent issue of the Tufts Nutrition Magazine. Research and science continue to prove that the healthy benefits of yogurt are not to be overlooked, and this article brings these points to the front of the discussion. Yogurt is also emphasized as a key source of vitamins and minerals that are crucial to a healthy diet. As part of our continued effort to research the impacts and effects of eating yogurt on the health of Americans, we will continue working with researchers, academics and food and nutrition experts to develop policy that emphasize its role in healthy eating habits.